Housed in an old tea warehouse on Bristol’s Floating Harbour, Arnolfini is one of Britain’s most ambitious contemporary arts centers. Visual arts, film, and music are all equally respected at Arnolfini, which recently had the privilege of hosting the U.K. premier of John Akomfrah’s sublime Vertigo Sea, a three-screen film installation that was much talked about at last year’s Venice Biennale. The center is free to visit, which is just as well as you will want to save your cash for the irresistible on-site bookstore. Maritime trading may have ceased long ago but the harbor still plays an important part in cultural life. Bristol’s historic port, named the Floating Harbour because the water level remains constant, is nowadays home to cultural venues, including the M Shed museum, and many bars and restaurants. The live music venue, Thekla, occupies a former cargo ship-turned showboat-turned nightclub moored in the harbor’s Mud Dock area. One of the prettiest views of Bristol is from a boat trip that operates out of the Floating Harbour. The brightly colored terraced Victorian houses of Cliftonwood make a beautiful reflection in the water. If you’d rather stay on dry land, it is a short walk uphill to explore the colorful neighborhood, also home to the cozy, family-run pub, The Lion. When Bristol’s street artists are not adorning the walls of Bristol with their witty, satirical or just plain pretty artworks, they are leading visitors around the city on a tour of the best murals. Starting in the city center, Where The Wall offers two-hour-long walking tours of the city on Saturdays and Sundays. The tours take you through the city via work by local favorites Banksy, Nick Walker and Inkie, as well as international artists such as Connor Harrington. If inspiration strikes, you have the opportunity to try your own hand at spraying and stenciling. Bristolians are fiercely independent. In a bid to avoid the fate of most British high streets, filled with the same generic chain stores, the city introduced the Bristol Pound, the U.K's first city-only currency, to be used in independent shops. Exchange your £s for Bristol Pounds at one of the city’s cash points, then head for Gloucester Road or Park Street, two of the best independent shopping streets in the U.K., to spend them at a craft shop, secondhand bookstore or kitschy cafe. Completed in 1864, the great Clifton Suspension Bridge is, alongside the SS Great Britain, one of Isambard Kingdom Brunel’s two most famous contributions to the Bristol landscape. Truly an inspiring sight, not to mention a great feat of engineering, the bridge spans the Avon Gorge at a height of 245 feet, linking the charming Bristol suburb of Clifton with the village of Leigh Woods in North Somerset. It’s free to walk across but to drive it will cost you a Pound (sadly Bristol Pounds are not accepted). One of the U.K.'s oldest surviving outdoor swimming pools, the long-neglected Victorian-era Clifton Lido has been lovingly restored to its former glory in recent years and is now open year-round, rain or shine—though obviously most pleasant in the summer. Tucked away on a quiet street in Clifton, this urban retreat also features a full spa, with a sauna, a steam room, a hot tub and treatment rooms, as well as a fantastic glass-fronted restaurant, housed in the old viewing gallery overlooking the pool. Bristol really comes to life in the summertime. When the temperature warms up, Bristolians hit the streets to enjoy pop-up shops, street eats and a multitude of festivals. Held in Eastville Park over the last weekend in May, Love Saves the Day is the city’s best music festival. Headliners this year include Dizzee Rascal and local boy Roni Size. Upfest, Europe’s biggest street art and graffiti festival, takes place in late July, while in mid-August, the skies of Bristol will fill with brightly colored balloons as the Bristol International Balloon Fiesta (pictured) returns bringing with it fairground rides and firework displays. There’s something in the River Avon’s waters. Nestled in the hills of the West Country, next to the river, the city of Bristol has a youthful, offbeat character that distinguishes it from any other English city, and a creative and cultural output to rival that of the capital. Set around a harbor and once a major center of maritime trade, Bristol is home to many sites of historic interest—from its iconic suspension bridge to the ground-breaking steamship, the SS Great Britain—but has become better known over the past few decades for its thriving arts scene. 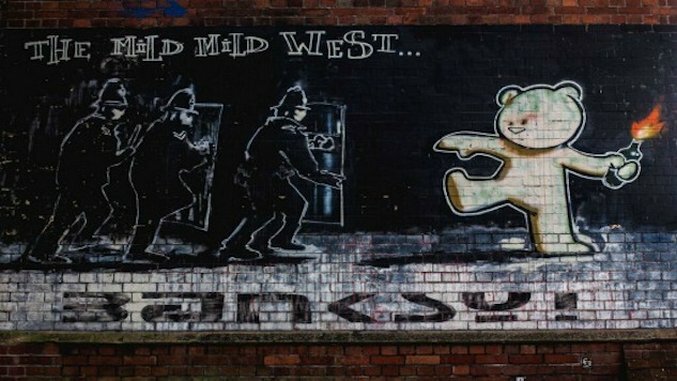 Bristol is the birthplace of street artists Banksy and Nick Walker, as well the eternally popular Aardman Studios, creators of beloved plasticine characters Wallace and Gromit, and the “Bristol Sound” music scene, which gave us bands like Massive Attack and Portishead. Here are a few of the things that make Bristol, less than three hours outside of London, a worthy trip.